It rises in southwestern Minnesota, in Big Stone Lake on the Minnesota–South Dakota border just south of the Laurentian Divide at the Traverse Gap portage. It flows southeast to Mankato, then turns northeast. It joins the Mississippi south of the Twin Cities of Minneapolis and St. Paul, near the historic Fort Snelling. The valley is one of several distinct regions of Minnesota. The name Minnesota comes from the Dakota language phrase, "Mnisota Makoce" which is translated to "land where the waters reflect the sky", as a reference to the many lakes in Minnesota rather than the cloudiness of the actual river. For over a century prior to the organization of the Minnesota Territory in 1849, the name St. Pierre (St. Peter) had been generally applied to the river by French and English explorers and writers. Minnesota River is shown on the 1757 edition of Mitchell Map as "Ouadebameniſsouté [Watpá Mnísota] or R. St. Peter". 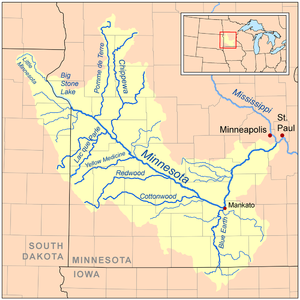 On June 19, 1852, acting upon a request from the Minnesota territorial legislature, the United States Congress decreed the aboriginal name for the river, Minnesota, to be the river’s official name and ordered all agencies of the federal government to use that name when referencing it. The valley that the Minnesota River flows in is up to five miles (8 km) wide and 250 feet (80 m) deep. It was carved into the landscape by the massive glacial River Warren between 11,700 and 9,400 years ago at the end of the last ice age in North America. Pierre-Charles Le Sueur was the first European known to have traveled along the river. The Minnesota Territory, and later the state, were named for the river. The river valley is notable as the origin and center of the canning industry in Minnesota. In 1903 Carson Nesbit Cosgrove, an entrepreneur in Le Sueur presided at the organizational meeting of the Minnesota Valley Canning Company (later renamed Green Giant). By 1930, the Minnesota River valley had emerged as one of the country's largest producers of sweet corn. Green Giant had five canneries in Minnesota in addition to the original facility in Le Sueur. Cosgrove's son, Edward, and grandson, Robert also served as heads of the company over the ensuing decades before the company was acquired by General Mills. Several docks for barges exist along the river. Farm grains, including corn, are transported to the ports of Minneapolis and Saint Paul, and then shipped down the Mississippi River. The Towboat J.L. Fleming brings empty grain barges into Port Cargill on the Minnesota River, a tributary of the Mississippi River. The Minnesota River Valley and tributaries as seen from the air at Redwood Falls, Minnesota. The river occupies only a small portion of the wide valley carved by the Glacial River Warren. View of the Minnesota River from Memorial Park; southeast of Granite Falls, MN. ^ "Mnisota Makoce: A Dakota Place". Bdote Memory Map. Retrieved September 21, 2017. ^ ""Minnesota State"". Minnesota Historical Society. Archived from the original on March 31, 2015. Retrieved March 21, 2010. ^ Mary Wheelhouse Berthel (June 1948). Horns of Thunder: The Life and Times of James M. Goodhue. Minnesota Historical Society. pp. 179–. ISBN 978-0-87351-518-4. ^ Sansome, Minnesota Underfoot, pp. 118-19. ^ "Peas, corn and beyond: Minnesota's Green Giant company was a canned food pioneer". MinnPost. August 1, 2013. Retrieved October 6, 2015. ^ Minnesota: A State Guide. US History Publishers. 1938. pp. 388–. ISBN 978-1-60354-022-3. ^ "The Cosgrove Years". Mayohouse.org. Archived from the original on March 24, 2007. Retrieved December 12, 2007. Sansome, Constance Jefferson (1983). "Minnesota Underfoot: A Field Guide to the State's Outstanding Geologic Features". Stillwater, MN: Voyageur Press. ISBN 0-89658-036-9. Waters, Thomas F. (1977). The Streams and Rivers of Minnesota. Minneapolis: University of Minnesota Press. ISBN 0-8166-0960-8. Wikimedia Commons has media related to Minnesota River. "Minnesota River" . Collier's New Encyclopedia. 1921. "Minnesota, a river which crosses the state of Minnesota" . The New Student's Reference Work . 1914. "Minnesota River" . New International Encyclopedia. 1905. "Minnesota, or St. Peter's, a river of Minnesota" . The American Cyclopædia. 1879.